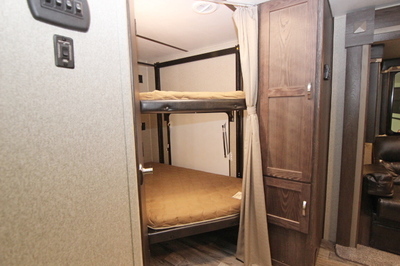 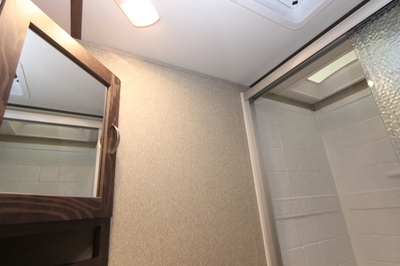 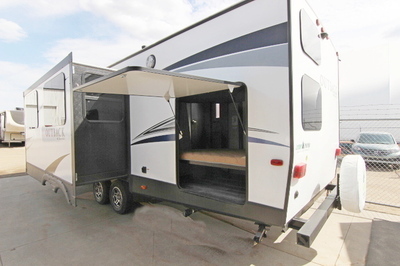 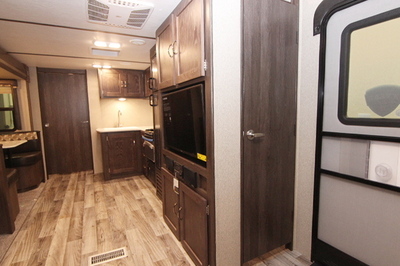 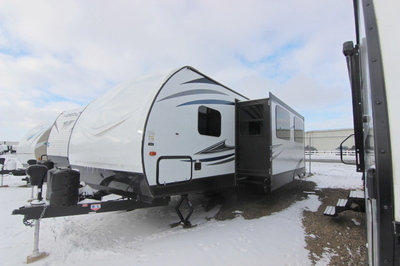 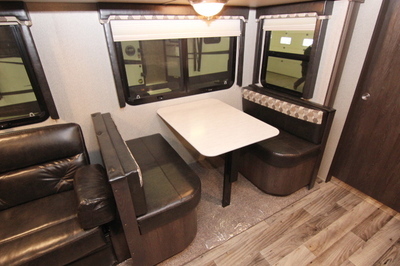 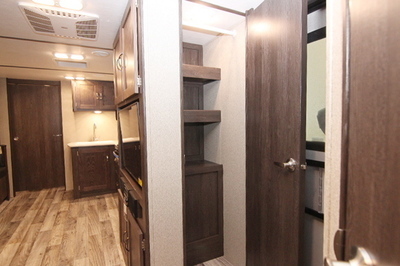 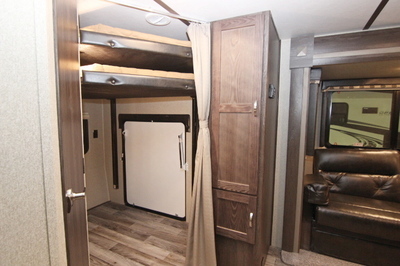 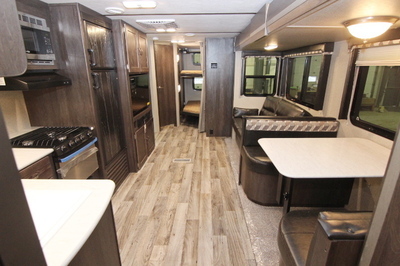 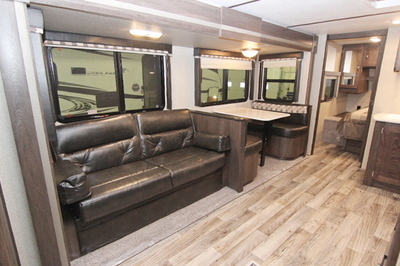 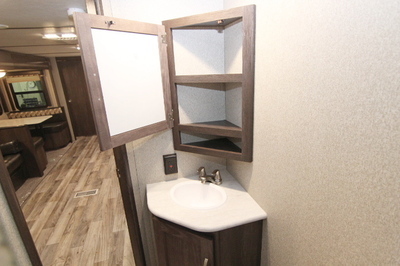 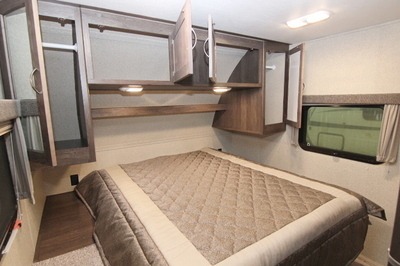 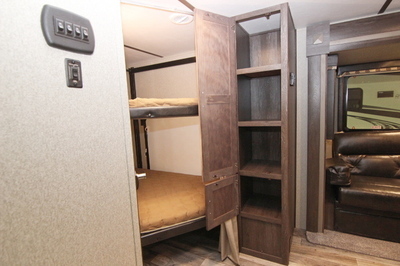 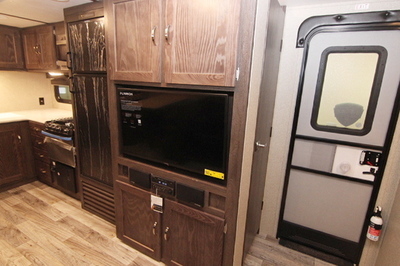 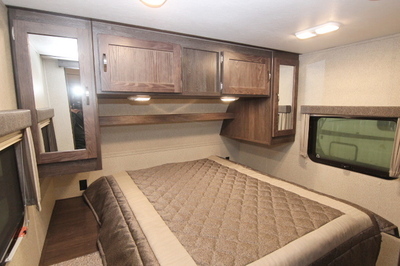 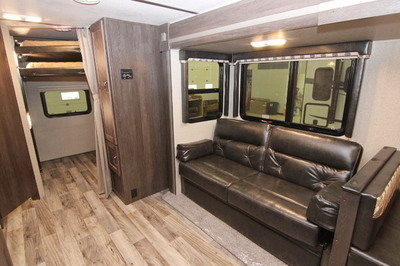 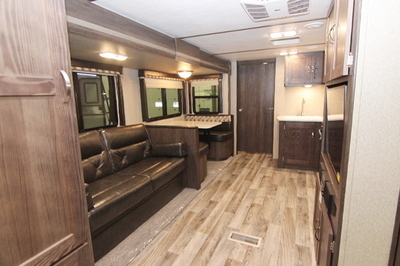 Packages and Upgrades Included with this Unit:- Booth Dinette, Outside Kitchen, Happy Jack Electric Bunks, Deluxe Sleeper Sofa, Interior Group, Exterior Group, Outside Camp Kitchen, Fiberglass Front Cap, 15.0 BTU Air Conditioner - Ducted. 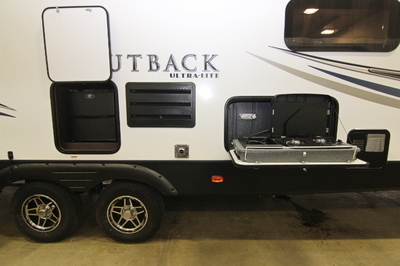 Outback Designer Package - Coat Hooks,Utensil Rack, Innerspring Mattress, Bedspread, LP Cover, MCD Roller Shades,Decorative Wall Lights, Trash Can. 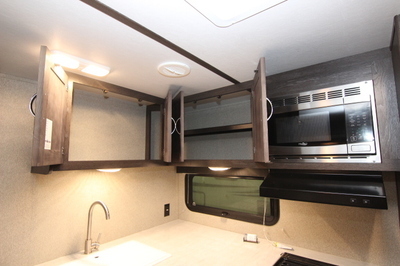 Kitchen (Most Models),Electric Awning w/LED Lights, Enclosed and Heated Underbelly, Exterior Speakers, Magnetic Door Catches, Aluminum Rims. 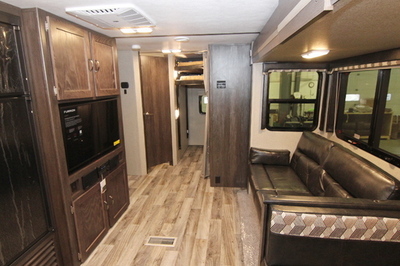 Ultra Lite Interior Group:- AM/FM/CD/DVD Player – Bluetooth Enabled, 3 Burner Range w/Oven, LCD HDTV, Skylight in Bath, Ducted Air Conditioner, Microwave, Pleated Shades, 6 Gal Gas/Electric DSI Water Heater, 8 Cubic Ft Refrigerator, Deluxe Sleeper Sofa, USB Charging Ports, Stainless Steel Appliances, Hand Glazed Mystic Maple Cabinet Doors, LED Lights. 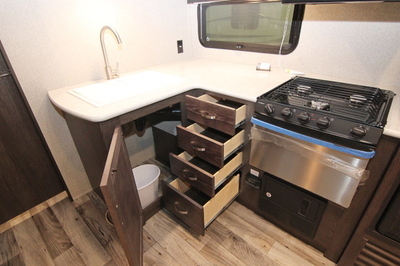 Kitchen: - Deep Single Basin Sink With 3” Drains, 8 Cu Ft Refrigerator,High-Rise Faucet, Stainless Steel Microwave, Upgraded Laminate Countertops,Pantry with Removable Shelves (Most Models). 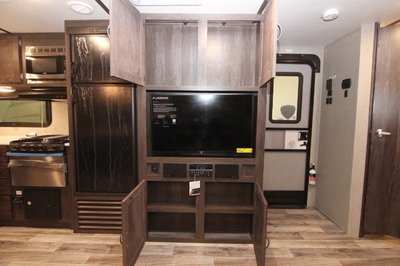 Bedroom:- Deluxe Innerspring Mattress, TV Hook-Up, Jalousie Windows for Maximum Ventilation,Residential Bedspread, His and Her Lights, Bedroom Speakers, 2 Shirt Closets, TV Cubby (Most Models). 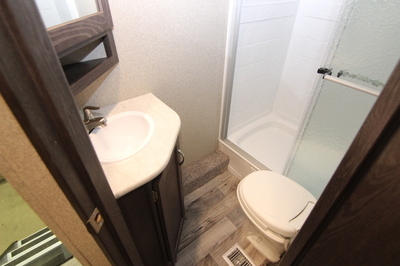 Bathroom: - Power Roof Vent, Skylight Over Tub, Tub Surround, Deluxe Medicine Cabinet, Large Linen Closet (Most Models),Radius Shower (272, 278). 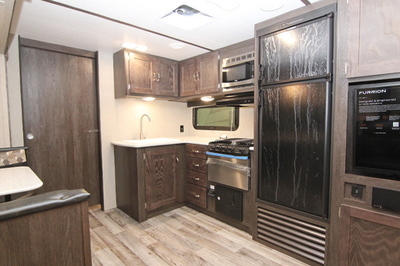 Appliances: - AM/FM/CD Stereo with DVD Player, MP3 Hookup and Bluetooth Enabled(N/A In 210URS, 240URS and 250URS), 8 Cu.Ft Refrigerator, 3 Burner Range with Oven, Six Gallon Gas/Electric DSI Water Heater ByPass with 16.2 Gallons Per Hour ‘Quick Recovery’, 13,500 BTU A/C Wall Thermostat, 30000 BTU Furnace,Stainless Steel Microwave. 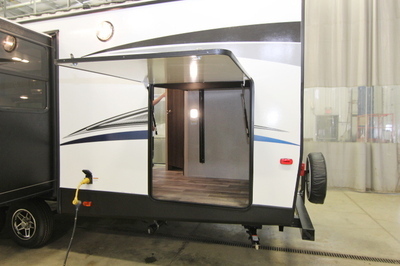 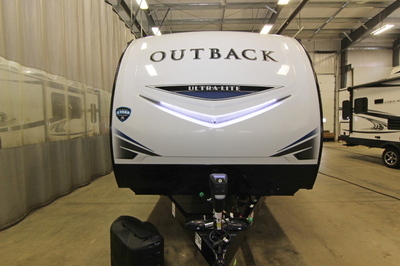 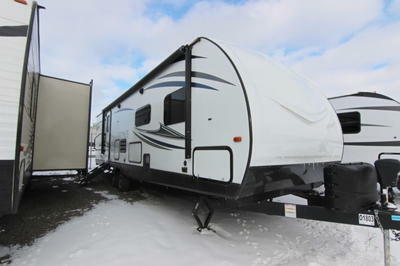 Exterior Standards: - Polar White Fiberglass, Frameless Tinted Windows, Triple Radius Entry Step, Black Tank Flush, Extra-Large Baggage Doors 1” Thick With Continuous Hinge And Rubber D-Seal, Extended Drip Caps and Full Length Drip Rail, Porch Light/Step Light, Hitch Light, Weather Encapsulated Body Trim, Exterior 120v Receptacle, Heated Enclosed Underbelly Including Tanks And Valves, LP Tank Cover, Automobile Style Fender Skirts,Double Welded Dual Battery Brackets, Exterior Easy Lube Axles, Outside Camp Kitchen, Exterior Quick Connect LP Hook Up, Stabilizer Jacks (4), Satellite Prep, Magnetic Door Holders, Aluminum Rims, Front Diamond Plate Rock Guards,Oversized Exterior Grab Handle, Power Tongue Jack, Off Door Side Activity Light, Friction Hinge Entry Door.